To be sure, the company has done well to claw its way back into the car market, with its share returning to 50% in FY14, as well as attaining a double-digit share in utility vehicles thanks to the success of the Ertiga. The company has used its deep knowledge of Indian consumers to produce cars that may not be terribly exciting but strike a chord with them, such as the Celerio, a small car with an automatic version. While more than 80% of the vehicles sold by Maruti Suzuki in FY14 cost less than Rs 6 lakh, it is now betting that many Indians have had enough of their little runabouts. 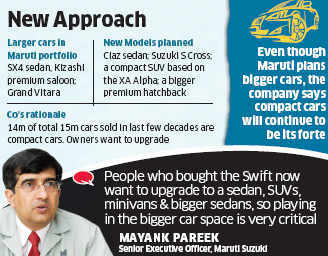 “There are millions of Maruti Suzuki customers who are looking for an upgrade,” Mayank Pareek, senior executive officer, Maruti Suzuki told ET. “People who bought the Swift now want to upgrade to a sedan, SUVs, minivans and bigger sedans, so playing in the bigger car space is very critical.” ET learns that four of the six all-new cars that the company plans to launch in the next 12-24 months will be in the segment above the Swift, with prices ranging from Rs 6 lakh to Rs 14 lakh. 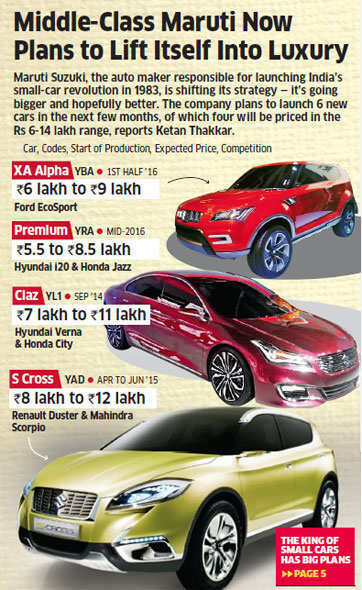 These new models include the mid-size Ciaz sedan to take on the Honda City and the Hyundai Verna; the Suzuki S Cross, a crossover that offers an alternative to SUV buyers; a compact SUV based on the XA Alpha concept; and a bigger premium hatchback to take on the Hyundai i20 and the new Honda Jazz. The rationale is clear: Of more than 15 million cars sold in the country over the last few decades, almost 14 million were compact cars. Many of these car owners are looking to shift up and the market leader wants to make sure it has the vehicles they’re looking for. In order to sustain its leadership, the company will have to upsize its models, Pareek said. “Compact cars will continue to be our forte, but we need to strengthen our presence in bigger cars,” he added. The larger cars sold by the company include the SX4 sedan, the Kizashi premium saloon and the Grand Vitara SUV, all of which are tepid performers. Experts said the SX4 has too staid a design for evolving Indian customers, while the Kizashi and the Grand Vitara were priced at Rs 16-25 lakh, making them too much of a leap for Maruti customers looking to upgrade. The Rs 6 lakh-Rs 14 lakh range is the right one for customers seeking an upgrade, seen as the reason why the Ertiga is a hit. “With the success of Ertiga, which brought (annual) incremental volumes of 60,000 to the company, all these four models are likely to bring in further incremental volumes of almost 1 lakh for the company, as they all fall in different price brackets,” said an industry analyst who did not want to be named. While the new products suggest a reorientation, they won’t be as ambitious as the Kizashi or Grand Vitara, said Deepesh Rathore, cofounder and director at Emerging Market Automotive Advisors.